MEDICINAREBERGET. 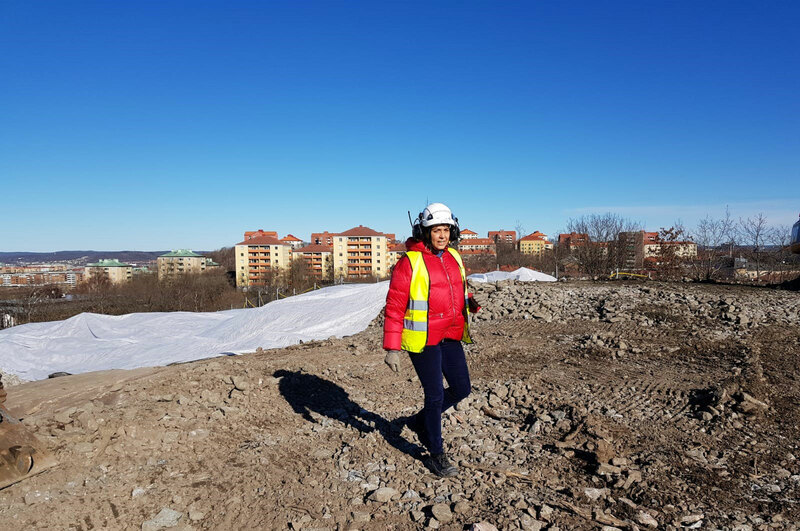 Below is information related to the Naturvetenskap Life construction project. Information will be sent to affected employees every two weeks, and it will also be published in Akademiliv (Academy Life). During the week we will be finishing work at the parking garage P-huset by the Zoology building. The contractor will be clearing away loose stones and securing large boulders using drilled stays. The sound of this activity corresponds roughly to the sound of an excavator and the work is going on for several hours at a time. However, it does not create vibrations. On the hill the excavator will continue to remove grass and dirt. This week we will begin using compressed air to clean off dirt from the underlying rock. This will allow the geologic consultant to inspect the condition of the rock and make plans for excavation. Down on Medicinaregatan, along the garden allotments, maintenance work continues clearing loose material from the slope of the hill and securing large boulders. The boulders will be secured using the same method as at P-huset, with stays drilled into the boulders. This will keep the boulders from rolling down in the future. In the pipe basement at Medicinarelängan, electricians will be reinstalling an electrical cable. The cable currently is drilled through the rock and must be moved before drilling for blasting can begin. Outside around the hill, we also are working on a fence to enclose the work site. Since we need to dismantle the fence that currently goes right over the hill, a new one has to be installed across the logistics yard of Experimental Biomedicine (EBM). Removal of grass and dirt and cleaning of the rock with compressed air will continue. Electricians will continue reinstalling the cable in the pipe basement. Down the slope towards the garden allotments, we will continue cleaning up and securing loose material. Around the work site, work on the fence will continue, and we will also install gates at our entrance. Cleaning and securing material at the allotments will be completed, and as soon as possible, we will remove traffic barriers so that traffic can return to normal. This week we will also start drilling and reinforcement up on the hill. This is important so that the wall on the hill facing Naturvetenskap Life will be as straight and attractive as possible. The fence around the work site will now be complete, and only an entrance below EBM will be used for access to the construction.